The following is a resource page for Cartoonists/Comic Artists I’ve put together in regards to the business side of the profession. It’s culled from various sources that I’ve found helpful or informative over the years. It doesn’t cover everything, but it can be used as a starting point. If there’s any links you’d like to suggest I add, just email me at jim@jimkeefe.com. I’m always on the lookout for items that are off my radar. Comic Book Resources Comic book news and reviews. Editor and Publisher Covers all aspects of the newspaper industry. Hogan’s Alley Magazine of the Cartoon Arts. The Daily Cartoonist Mainstream & Syndicate News. Graphic Artists Guild: Tools & Resources. 2005 – With Dave Sim’s annotations. Colleen Doran gives sage advice regarding working in the trenches. What I Think of Art School. The Specs on Specs: The Critical Importance of Following Guidelines. Ten Common Mistakes in Resumes and Cover Letters. 25 Things Writers Should Stop Doing. 10 Things Every Creative Person Must Learn. Agent reveals the depth of his integrity. Steve Bissette on drawing a graphic novel. How Do You Promote Your Small Press Comics? 2010 blog relating experiences with self-publishing. Comic Book and Trading Club stores. A three-year course of study – located in Dover, New Jersey. A two-year course of study located in White River Junction, Vermont. Recently the focus of the Documentary film Cartoon College. Check out student work on the MCAD Comic Art Tumblr. National union of illustrators, designers, web creators, production artists, surface designers and other creatives. Artists/members mostly from newspaper syndicates – but growing to include artists from all fields. Active groups in Minneapolis, San Francisco, Pennsylvania and Montreal. 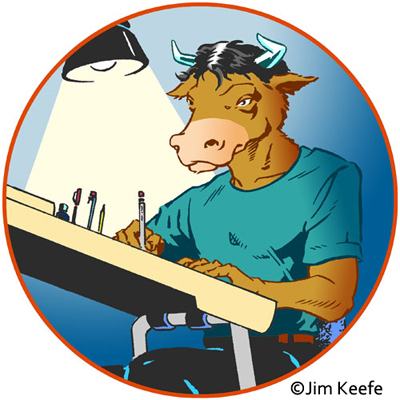 The Jay Kennedy Scholarship – Yearly award for best college cartoonist. Applicants must be students at a 4-year college in the United States, Canada or Mexico. Why this jilted Kickstarter backer decided to sue and why he was right. For more info, check out Working Professionally as a Cartoonist. It’s a resource page that includes all my work related posts on cartooning. Very helpful, thank you! Bookmarked! No nonsense advise and a good checklist for people who’ve been doing it awhile. Many thanks- I just added them to the list. What a GREAT resource! Thanks for putting it together Jim! I will refer many to it! Then we’re even as (after teaching a Pro Practice class at MCAD) I’ve been referring everyone to you. California College of Art (with campuses in Oakland and San Francisco) offers an MFA in comics. Many thanks for the info – just updated the posting with your link. Great resource page. Thanks for putting it together.